I’m not hitting on you, swear. 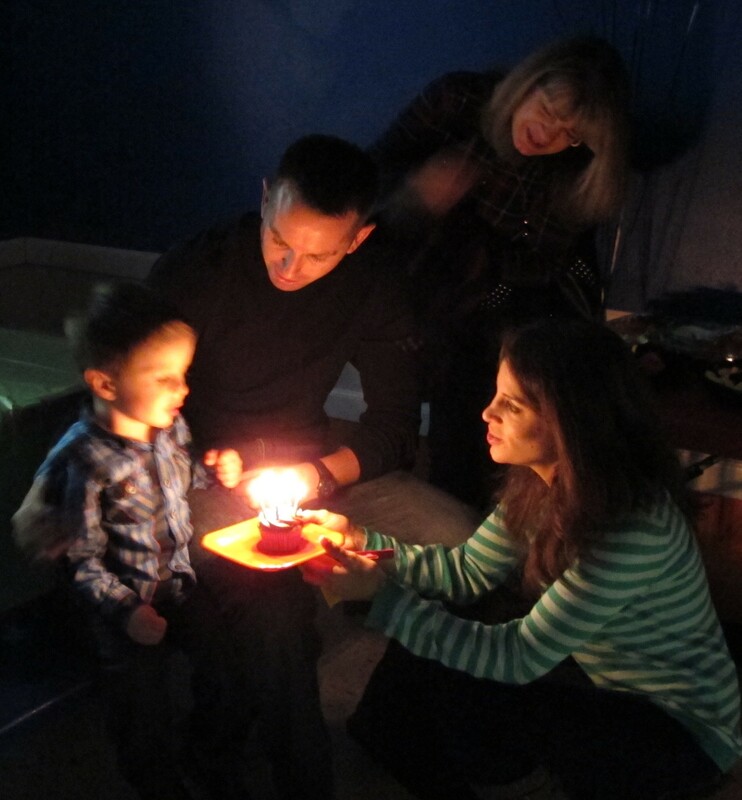 We had Lucas’s birthday party last weekend. 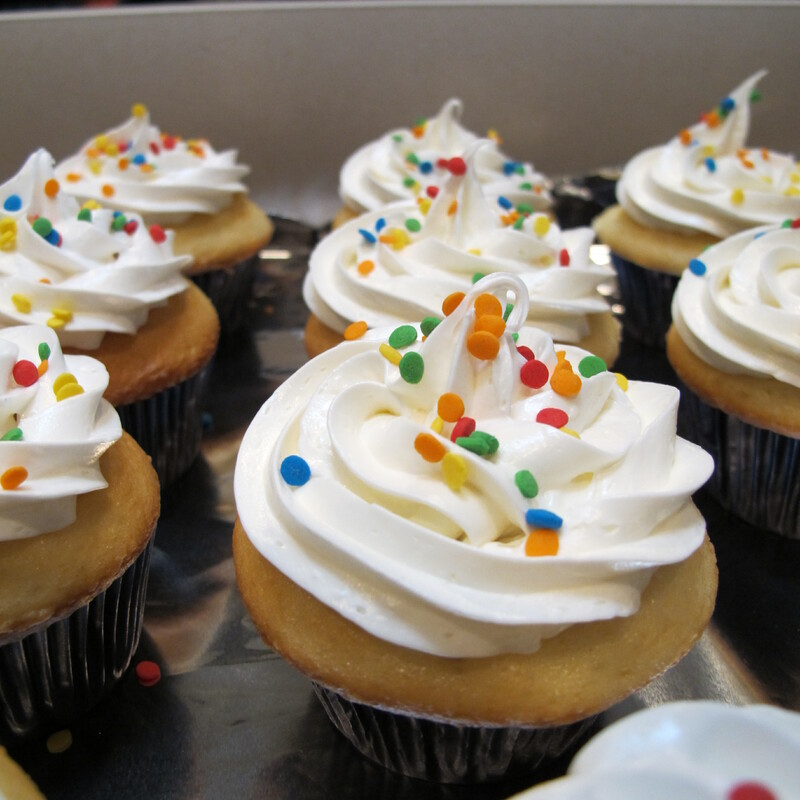 And with party comes cupcakes. At least in my world. I’m a total nerd for cupcakes. Decorating cupcakes to be exact. And I want to clarify straight off the bat that I’m no expert. 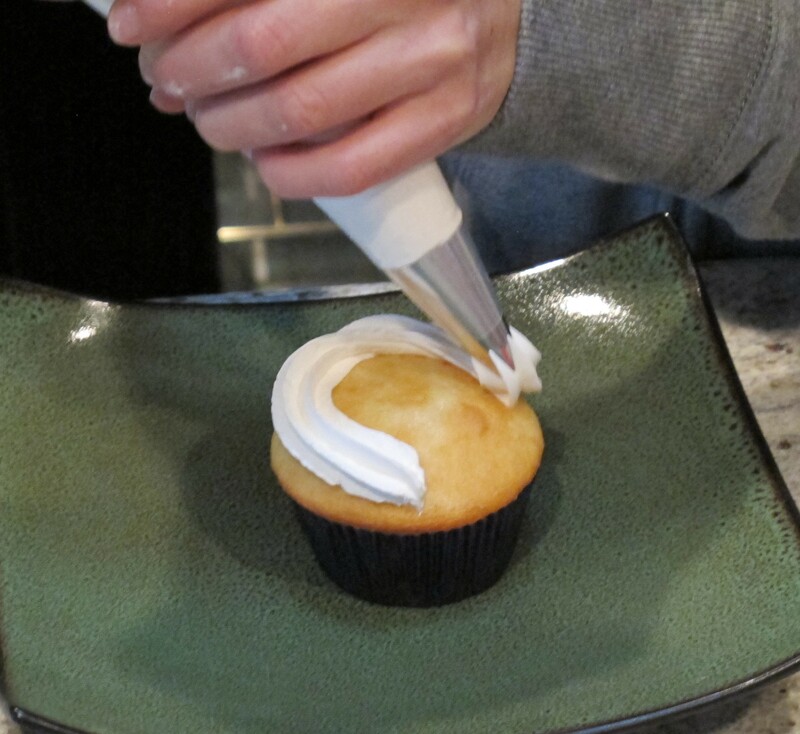 I just like to experiment with anything creative, cupcake-decorating included. I have no idea if this is the method used by professionals, but it’s worked for me so here I am. Last year, I went all out on Lucas’s cupcakes. 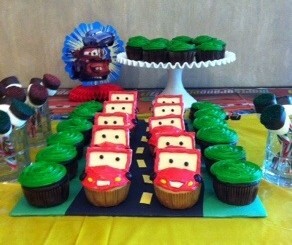 The theme for his party was the movie Cars. I followed this tutorial and created these little critters (sorry for the teeny pic… this was taken off my old phone)…. Little Lightning McQueens. I even went so far as to decorate a piece of cardboard with construction paper to make it look like a road. And I added green cupcakes to represent trees. 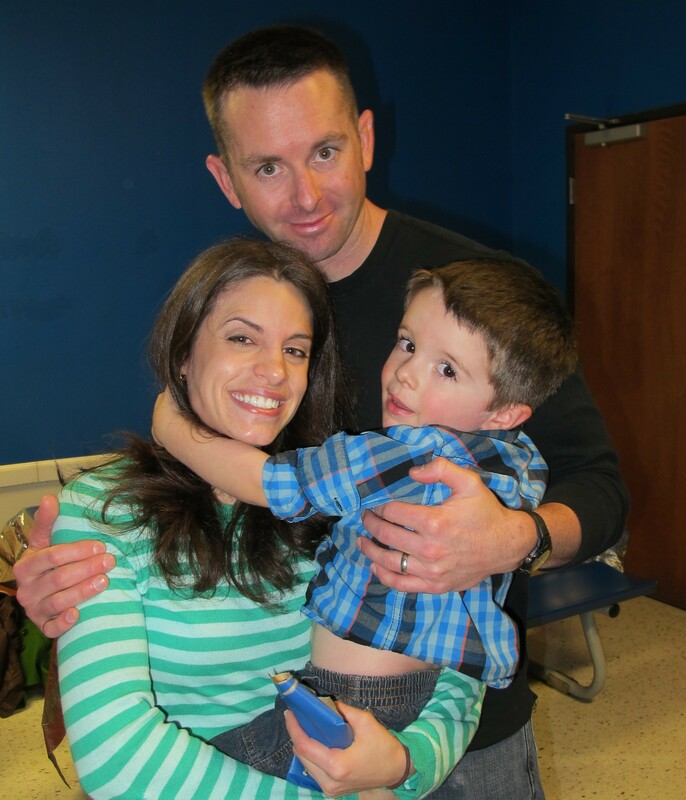 This holiday season has been much crazier than normal, so we decided to keep Lucas’s party simple. I just incorporated bright green, blue and red, some tablecloths, a few balloons… easy. 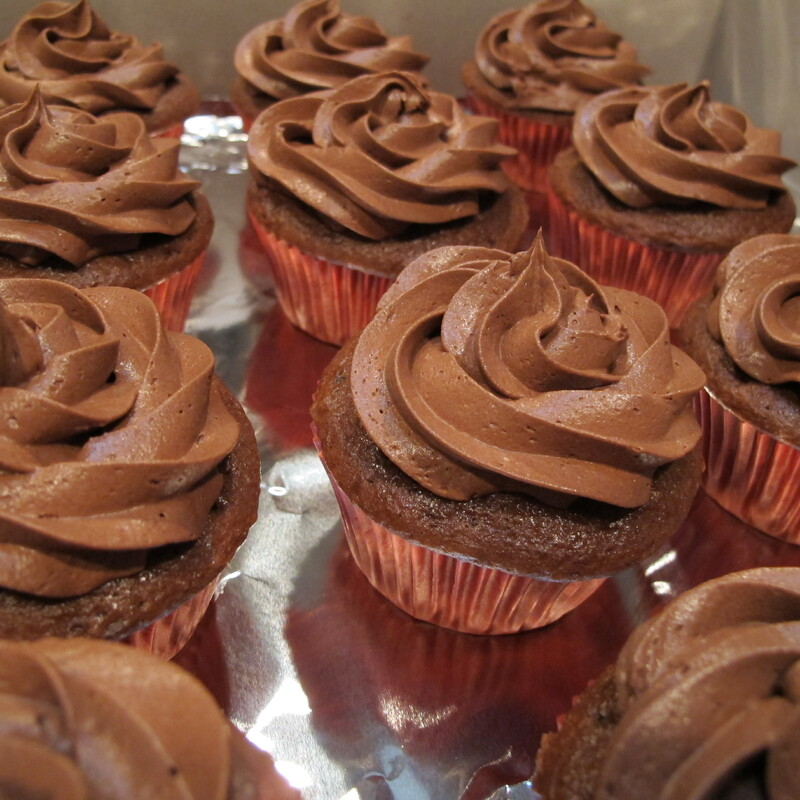 For cupcakes, I went with vanilla and chocolate. I know. Please don’t be bowled over by my creativity. 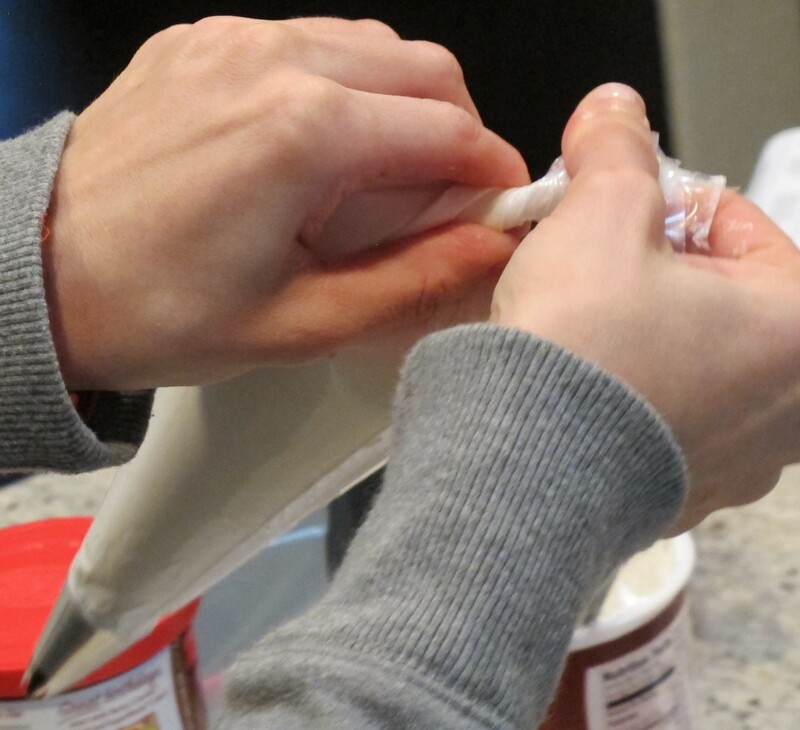 I used store-bought cake mix and store-bought frosting. Convenience was key. And it helps when convenience is tasty. 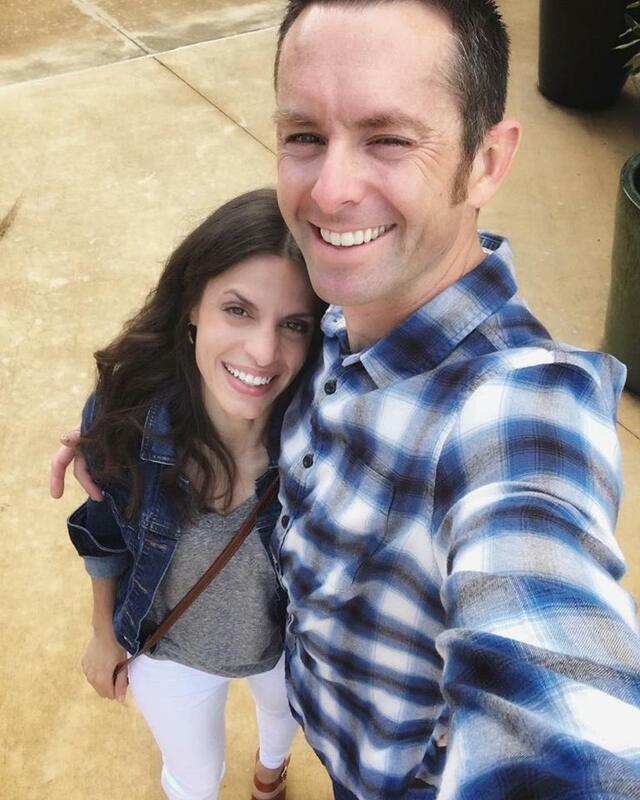 Which according to the gluten-eaters, it was. Or maybe they were just being nice. Either way, ILL TAKE IT! So, thank you dear friends. 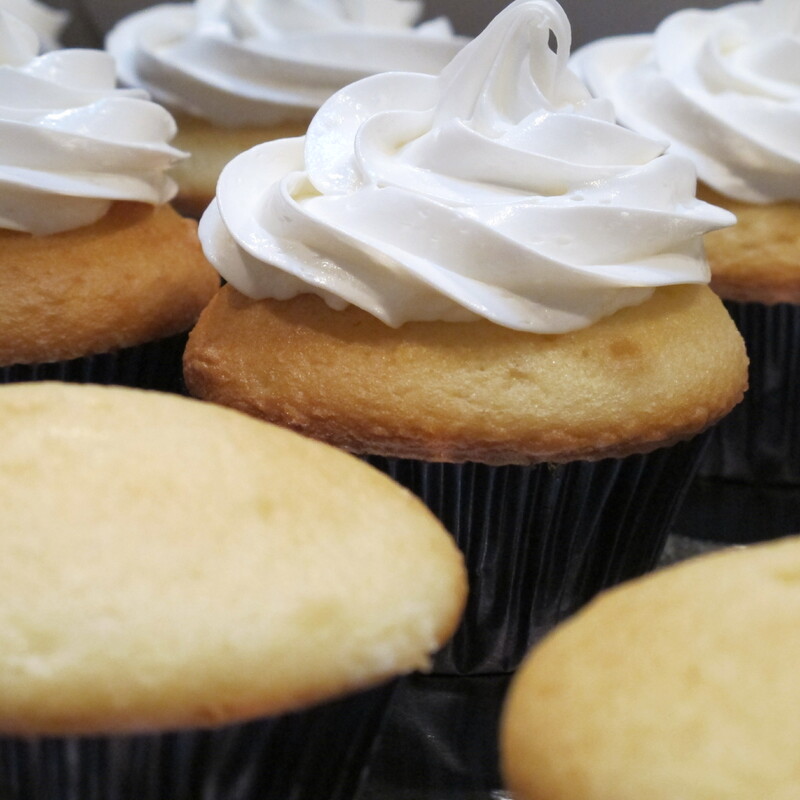 🙂 My mom and I both have celiac disease, so I usually try to incorporate some gluten-free cupcakes, but this year I just went with regular gluten-loaded goodness (no need to fret… We have PLENTY of GF goodies this time of year. Trust me. And there was no cheating to be had either. Promise.). 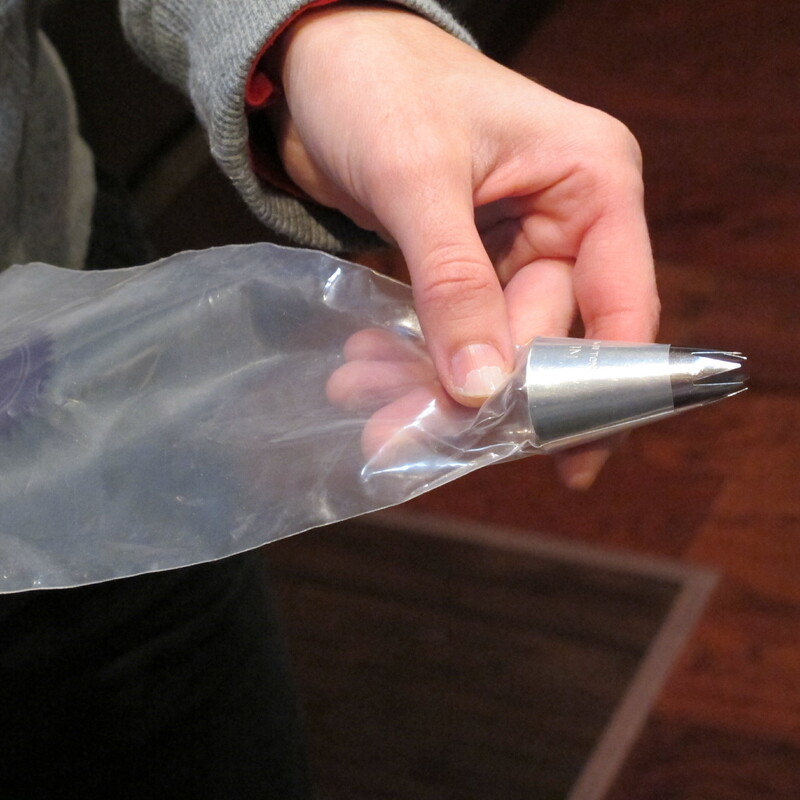 To prepare for the cupcake-decorating-palooza, I simply snip off the pointy end of my pastry bag with scissors and stuff the decorating tip into the narrow end of the bag. 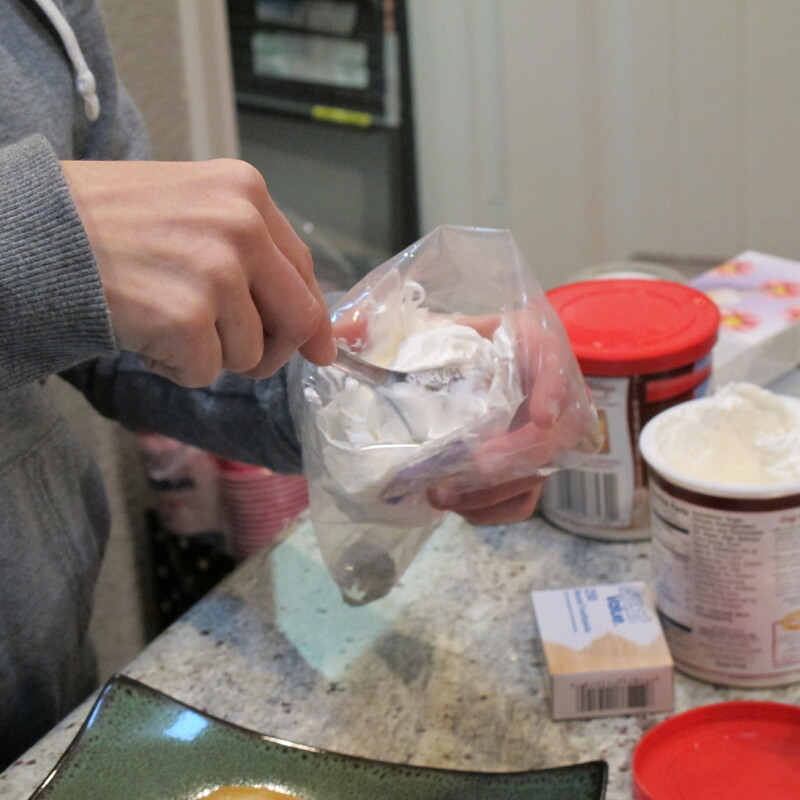 Once the frosting is in there, I gently straighten up the bag and twist the top end to keep the frosting from spilling out as well as to control the rate of frosting. I generally hold the bag with one hand around the twisted part to control pressure and the other towards the bottom to control movement. 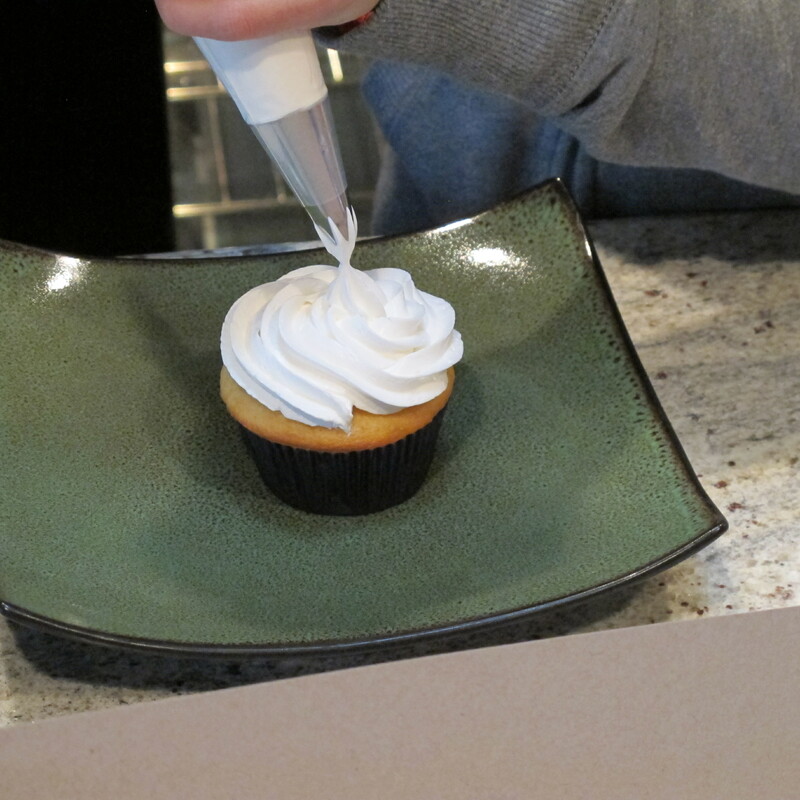 I start by doing a test pipe on my frosting lid. 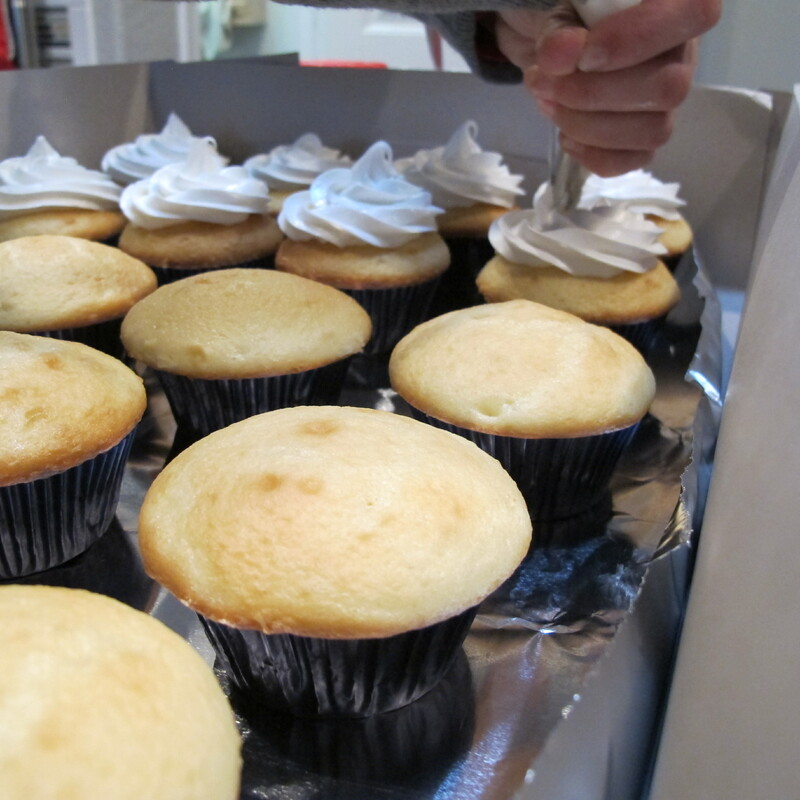 Just to make sure that the frosting is consistent and to hopefully rid the bag of air bubbles. 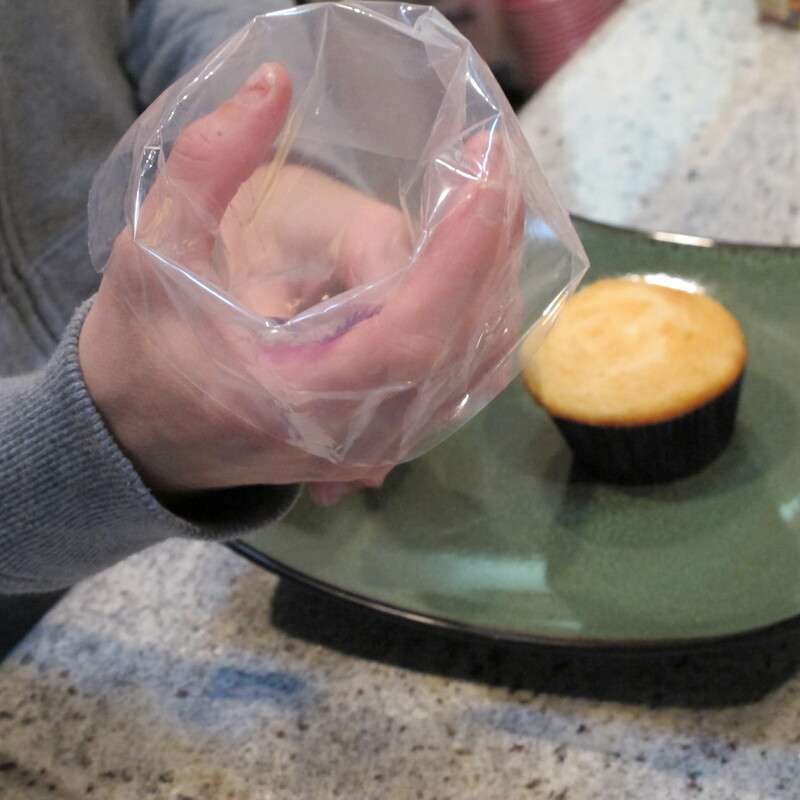 I mean, sure, air bubbles make funny farting sounds, but they also spray the frosting out in an ugly way. Not cool when you’re goal is purty. Best to rid of the gas from the start, chuckle into your hand, and move on from there. And spiral in towards the middle, giving consistent pressure to the pastry bag the entire time. Slow and steady to make sure there are no gaps between spirals. 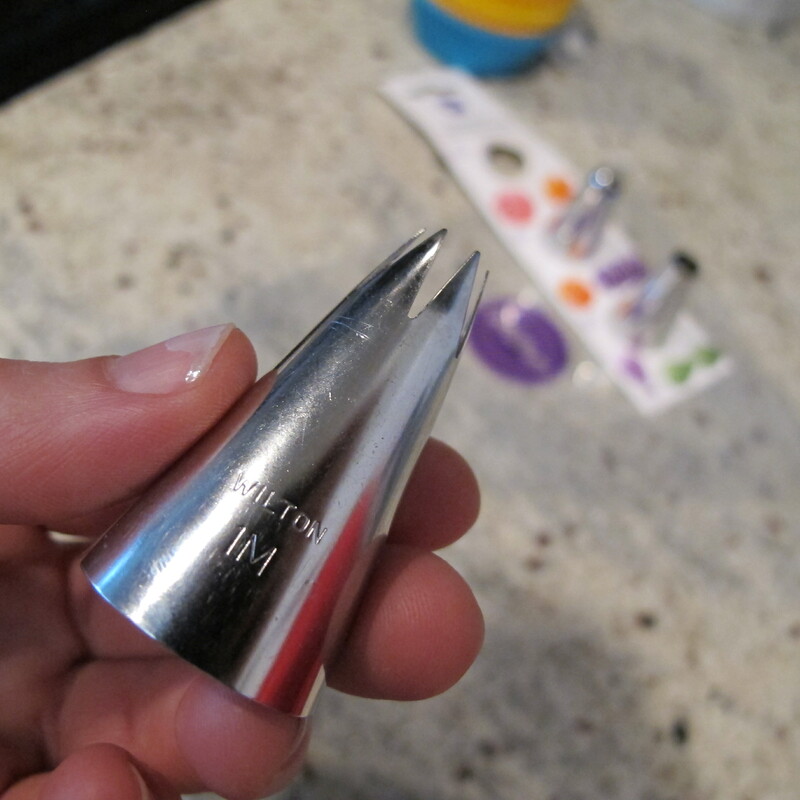 Once I reach the top, I simply release all pressure on the pastry bag and lift the tip directly upwards. Super easy and effective. And repeat 40 more times. 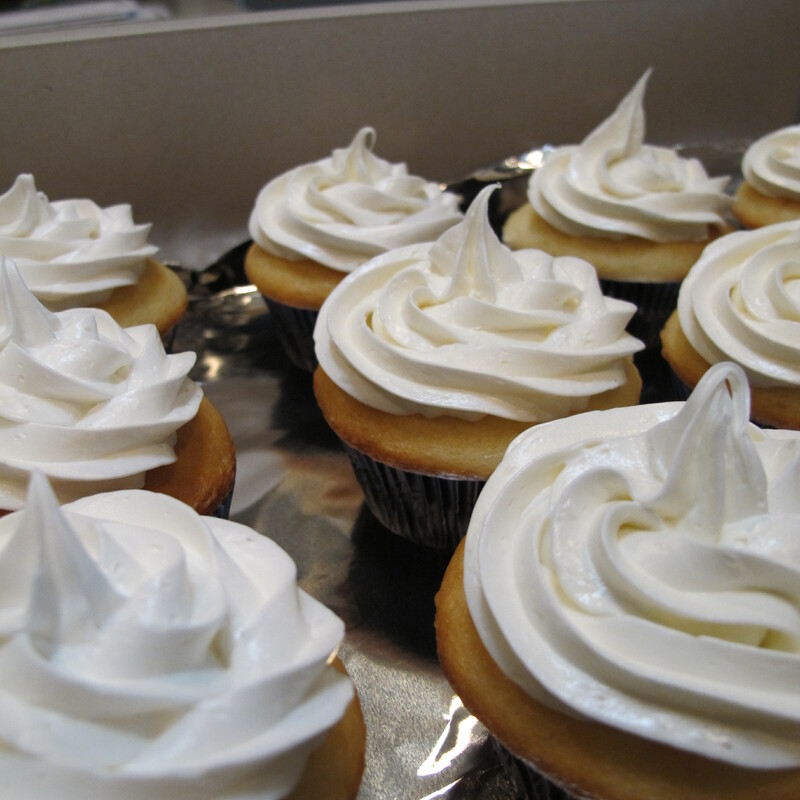 Here are the cupcakes after frosting…. I added some sprinkles as well…. …but I was in a rush so I never got a shot of the chocolate ones. I literally finished the cupcakes minutes before we had to leave. Way to procrastinate, Mom. 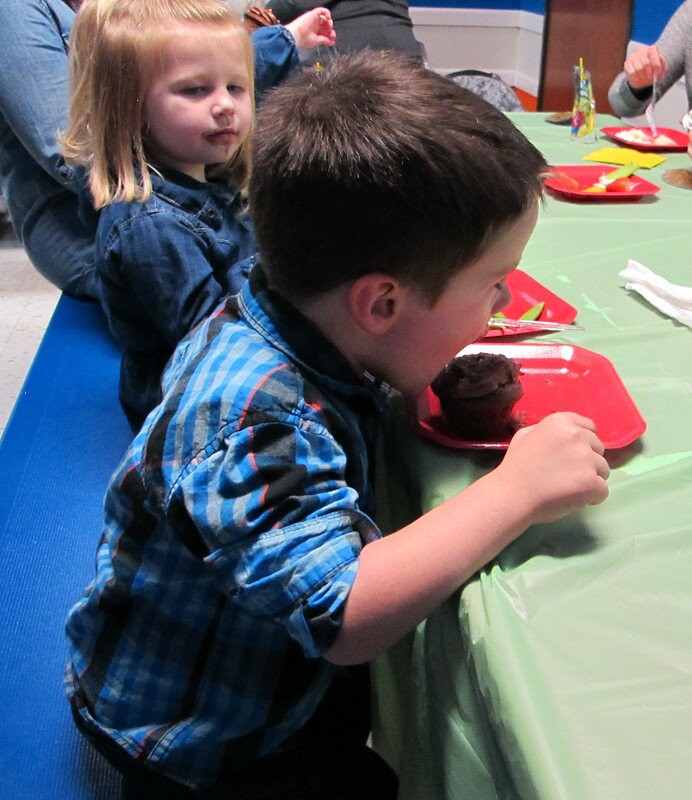 As for little man, Lucas seemed to enjoy the cupcakes immensely. He ate the frosting ONLY (Alas, he is my son). 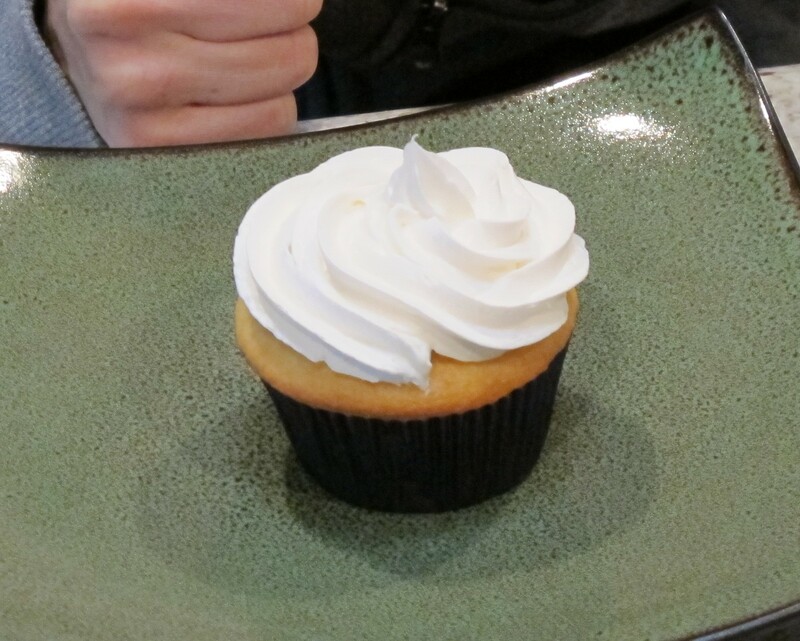 And my favorite quote of the day was when I asked him if he wanted a vanilla or chocolate cupcake and he stated very matter-of-factly in his little three-year old voice “No, thank you. 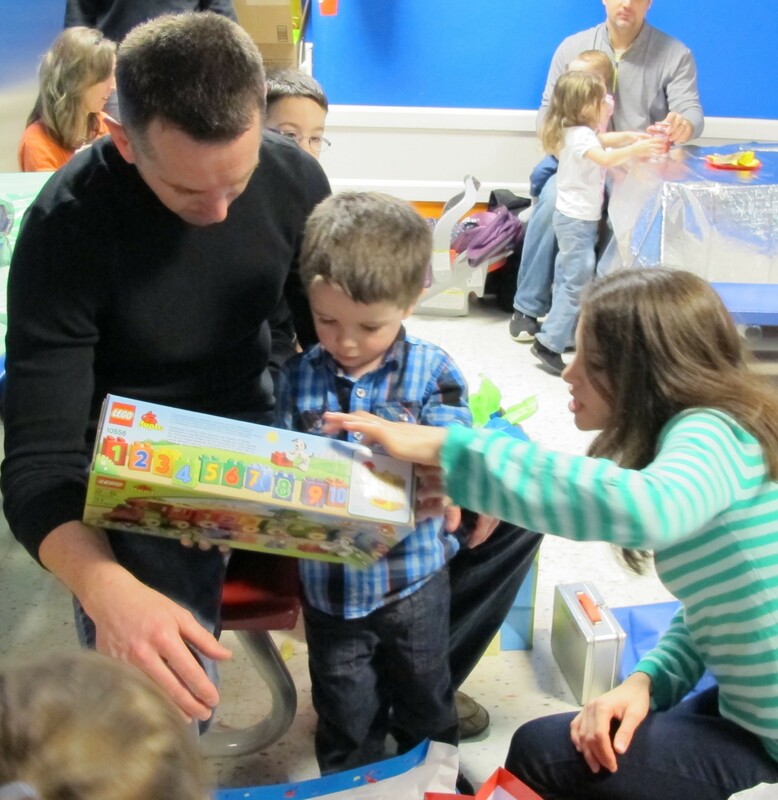 I okay… I just wanna open presents.” After I stopped laughing, I explained that he could do both. That we could sing happy birthday, eat a cupcake, then open presents. And it clicked. “OOOHHH! Choc.. No, VANIL… NO, No… VANIL…Chocolate. Chocolate.” It was like the excitement clouded his decision-making process. So. Funny. So, there you have it. 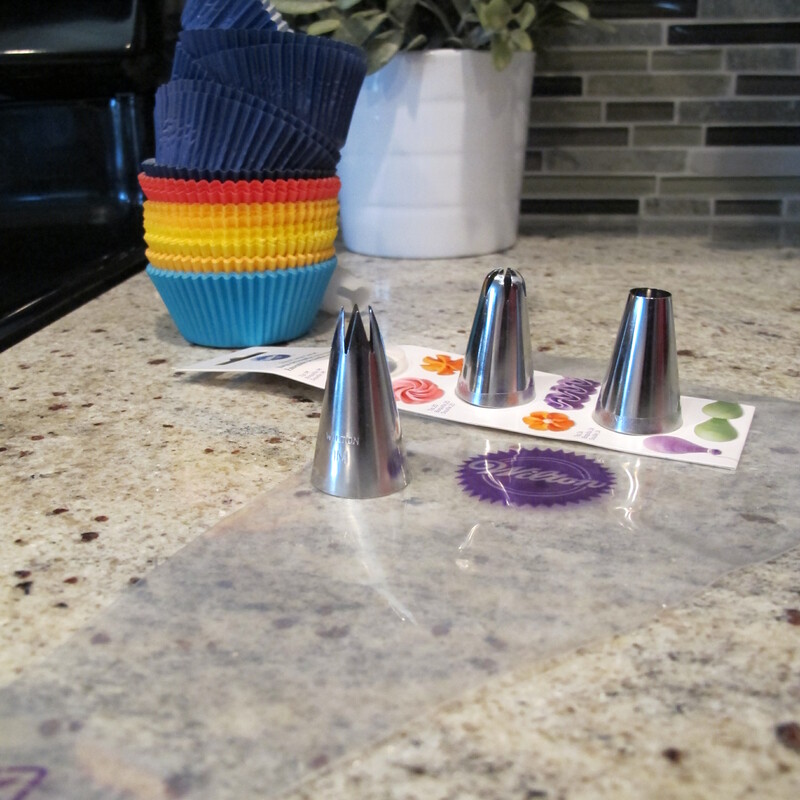 A little simple cupcake decorating with a smidge of party action. Good times!! 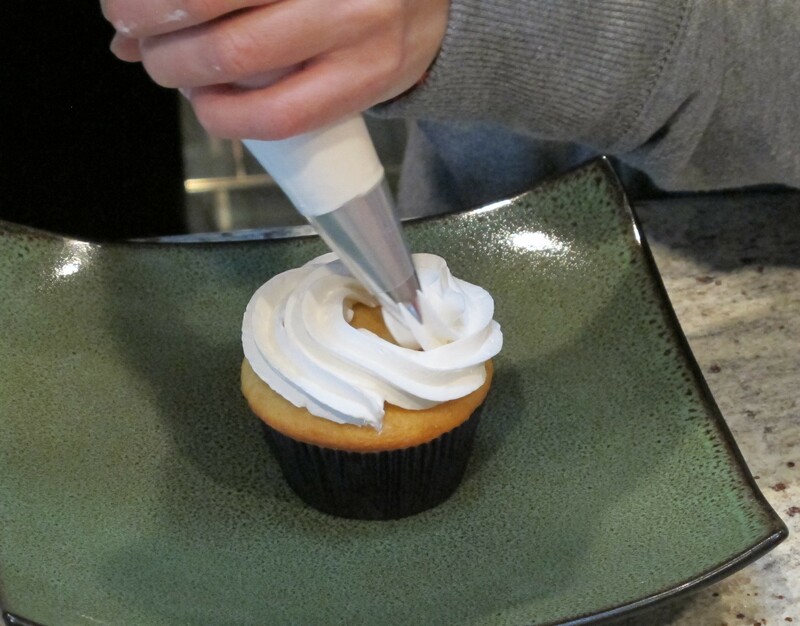 Anybody have a favorite cupcake decorating tip or trick to share?